تزوّجَ جلاّدٌ جلاّدةً، فأنجبا أقفاصاً لطيور أولادِ الجيران. في عيد زواجهما الأوّلِ أهداها سوطاً ناعماً. brachten sie Käfige für die Vögel der Nachbarskinder zur Welt. Zu ihrem ersten Hochzeitstag schenkte er ihr eine feine Peitsche. dann iss ihn auf, bevor er uns isst. Mohamad Alaaedin Abdul Moula, born 1965 in Homs, published literary texts since 1983. He is a member of the Syrian Arab Writers' Association and was Director of Museums and Antiquities in Homs from 1991 to 1996. 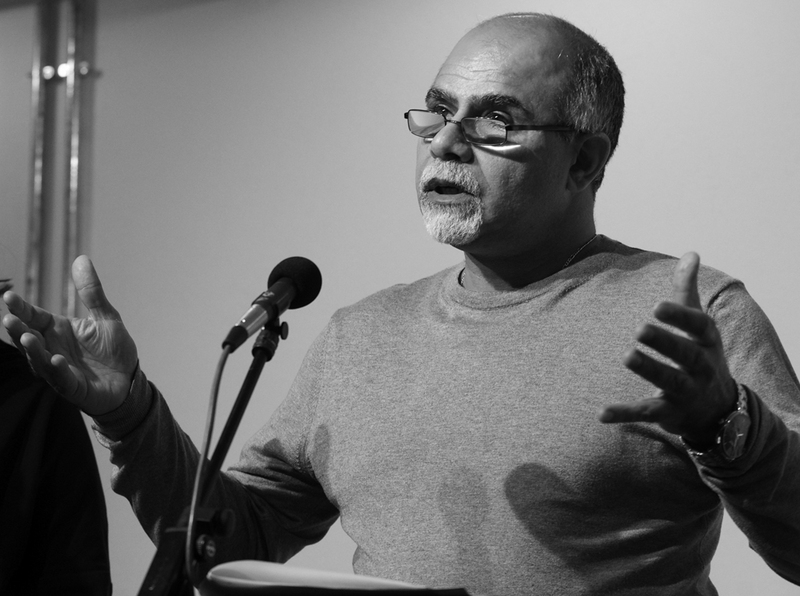 His literary texts are represented in important anthologies of contemporary Arabic poetry and he has been a guest at various literature festivals. He has published his first critical poems and prose texts in the early 1980s. Since then he has been repeatedly threatened and persecuted for his publications. Contacts with dissidents, such as the Syrian writer Faraj Bayrakdar, who was a guest author in the ICORN member city Stockholm, gave the security authorities cause for interrogation and censorship. Mohamad Alaaedin Abdul Moula has been living as a Hannah Arendt Scholar in Hanover since the end of 2015. Previously, he was a guest at Casa Refugio, Mexico City.